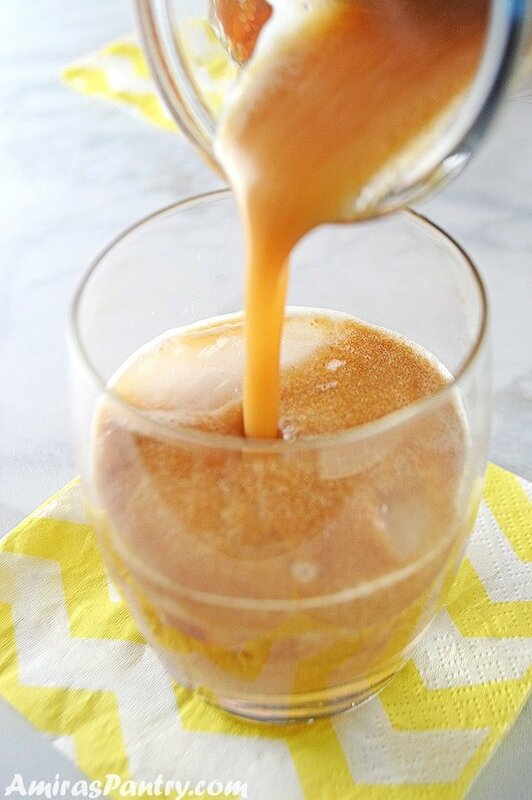 Sweet and sour tamarind juice is one of the most common refreshers in the Middle East. By far, this is one of my favorite thirst quenching drinks. 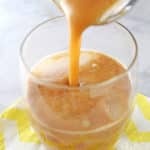 This chilled tamarind juice is a little sweet and a little tangy but seriously refreshing. Tamarind drink or as we call it in the Middle East “Tamr-hindi ” is a popular drink prepared from the tamarind wet pulp blocks with water and sugar. Make your taste buds happy with this tasty drink. This post has been updated from the original August 2013. Last updated February 2019. Sweet tamarind juice is usually sold by street vendors in Egypt especially during summer days. If you google “tamarind juice seller”, you’ll see pictures of a man holding a huge, probably copper, pot on his back with lots of cups arranged around his waist. This man used to also carry two copper discs in his hand, clanging them together to make a noise announcing that he is in the neighborhood, something like the ice cream truck. I still remember the rhythm he used when I was a little girl. It is very hard to find these guys nowadays, but I believe they still do exist probably around touristic sights. My mom never allowed us to buy things from street vendors, so I am used to the homemade version of tamarind juice. I like mine sour and sweet, some of my friends like it light, more like flavored water. So in this recipe I made it the way I like. You could drink it as is, or dilute it with more iced water. Sweet tamarind is especially popular during the holy month of Ramadan, along with sobia and Qamar-Addeen. These are sweet drinks that gives you the kiss of sugar you need after a long day of fasting. I was really surprised to know that this drink is not only sold in the Middle East but it is a very popular drink in Mexico called Agua de Tamarindo! What are the benefits of tamarind juice? Tamarind is an excellent source of vitamin B, C, potassium, magnesium, iron, thiamine, phosphorus, riboflavin, and fiber. Tamarind is believed to lower the risk of diabetes, aids weight loss, boosts digestion and also prevents chronic diseases. What does tamarind juice taste like? Sweet and sour I would say. 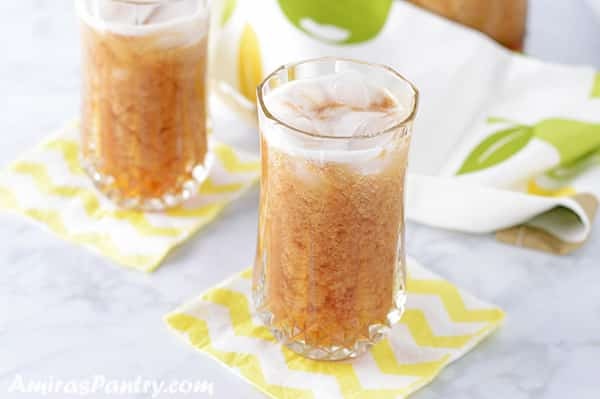 One of my kiddos described it as a very very concentrated lemonade with a hint of caramel. It is sour to the point that can make the back of your jaw tingles! You can dilute it ofcourse but if you like tangy stuff like me you are going to love it as is and it is going to send a shiver down your spine. What are the side effects of tamarind? Consuming tamarind in moderation is essential as any other thing in life. Too much can lead to diarrhea, also it works as a blood thinner so you need to be careful if you already take blood thinner medications. 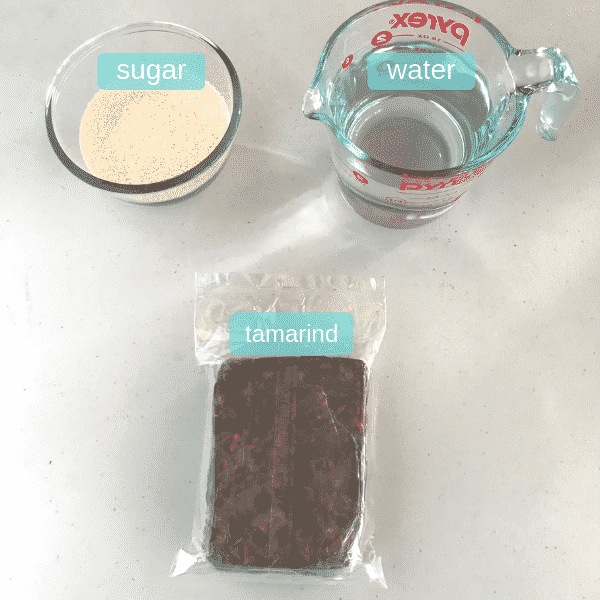 All you need is a tamarind wet pulp block, you can make it also with tamarind pods and I will tell you how at the end of this post. You’ll also need sugar is desired and water. Note that tamarind is sweet on its own so go easy on the sugar and experiment until you reach the desired sweetness. Break the tamarind block into large chunks and place in a deep pot. Cover with water and let it soak, trying to break it apart every now and then to release flavor and separate seeds. Let it soak for 8 hours. If you are in a hurry, you can go away with 4 if you pour hot water over it. Some people boil them together for like 30 minutes but I’ve heard that you lose a lot of nutrients this way, not sure though. 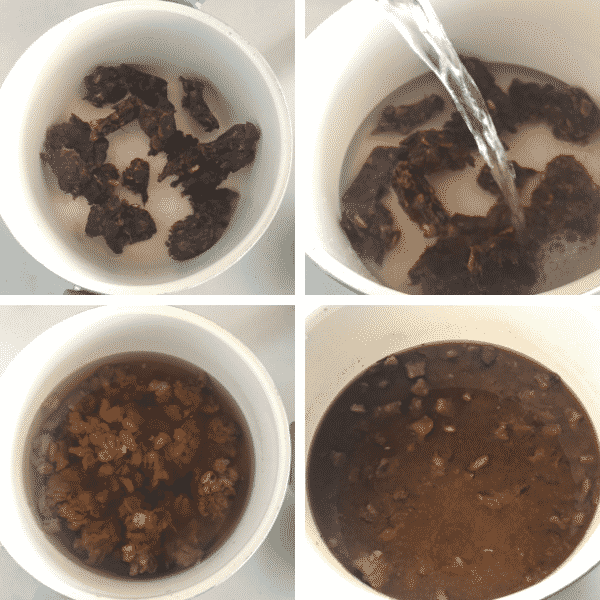 After the 8 hours, you’ll notice that you have a muddy brown water with seeds, skin and fiber floating around. Strain the water through a fine mesh sieve, some people use cheese cloth but I find this very hectic. You’ll end up with cloudy water, pour this cloudy water along with a sweetener of your choice if you like in your mixer and mix together. Pour over ice or refrigerate until you are ready to drink. Where to buy tamarind? Tamarind pods are not easy to find in the Middle East, that’s why it is more common to use the wet pulp blocks. You can find tamarinds pods, blocks and paste in the Indian, Middle Eastern, Carribian and some Asian stores. 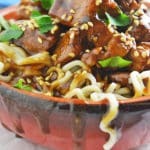 Can I use tamarind paste? tamarind paste sold in small tubs are more like molasses in consistency. I’ve used it while making tamarind chicken but for a drink I do not think it will be as flavorful as the pulps itself. How to make the drink with fresh tamarind pods? fresh tamarind pods can even be eaten as a snack. Peel the hard brown shell, remove the root like veins, and just eat the pulp avoiding the hard seeds inside. For the drink place the peeled pods in a pot and add to a pot then pour hot or cold water as usual trying to break things apart and let it soak then proceed with the recipe. For sweeteners: sugar is the most common, try to taste it without sweeteners first to check you liking. 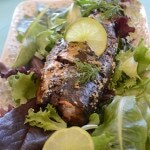 Others suggest using agave and coconut nectar as well. Other flavorings: Some people like adding rose water, orange blossom water or ginger or vanilla extract. 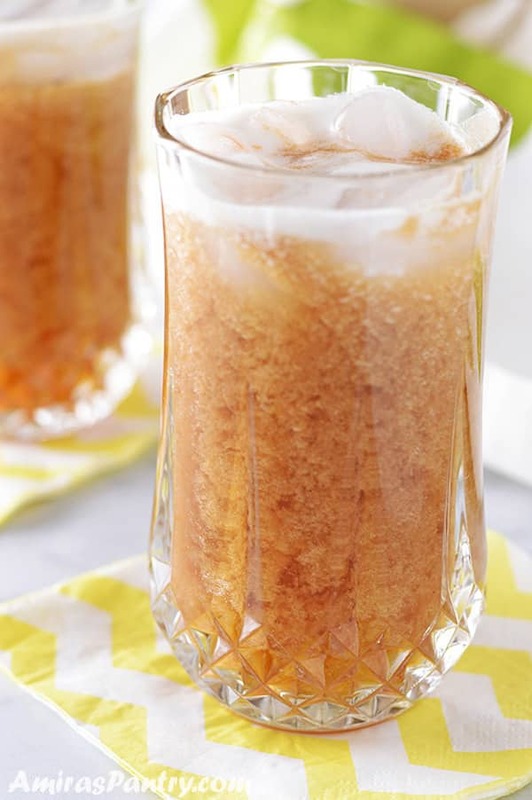 Enjoy the health benefits of tamarind in a refreshing chilled drink. Sweet and sour drink that is going to make your taste buds thank you. 1 paket 350g tamarind . 2 liter of cold water. In a deep pot or glass bowl, cut up tamarind paste to relatively small pieces. Pour in cold water, cover for 8 hours, try to stir a couple of times in between. (Note1), (Note2). Strain with a fine fine mesh sieve. 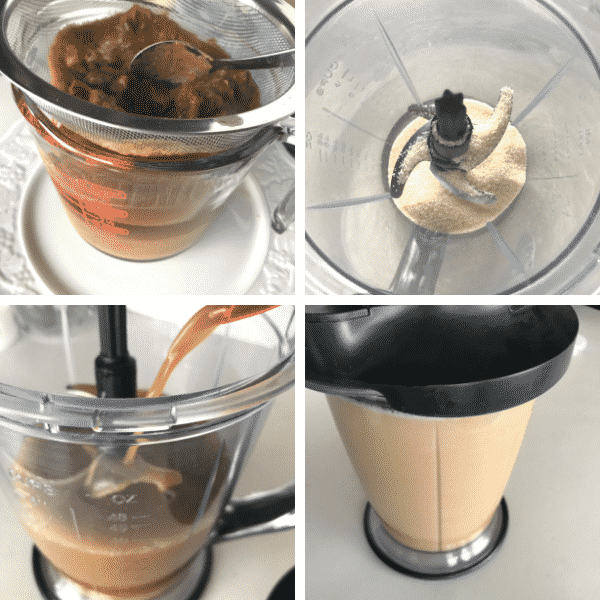 Add sugar to your liking and mix in a blender. Pour in a cups with some ice. Note1: If you are in a hurry you can use hot water and this will cut the soaking time to 4 hours. Note2: Some people like to boil the tamarind with the water, I’ve never used this method and I’ve heard that it decreases the tamarind health benefits. Nutrition facts are calculated without sugar.